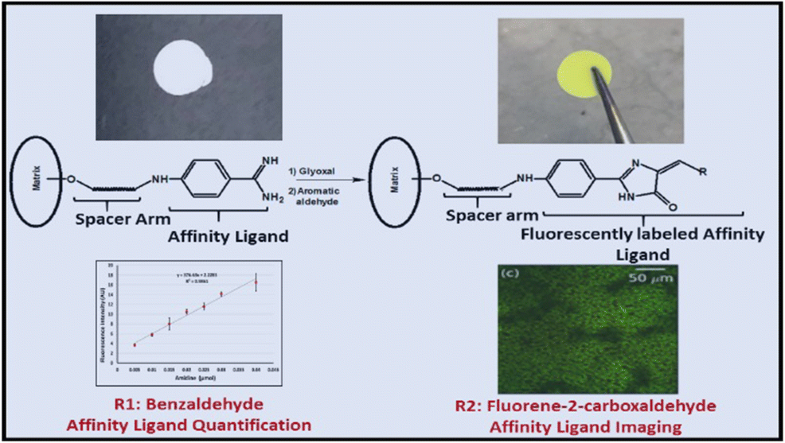 We report the development of a fast and accurate fluorescence-based assay for amidine linked to cellulose membranes and Sepharose gel. The assay is founded on the glyoxal reaction, which involves reaction of an amidine group with glyoxal and an aromatic aldehyde, leading to the formation of a fluorophore that can be analyzed and quantified by fluorescence spectroscopy and imaging. 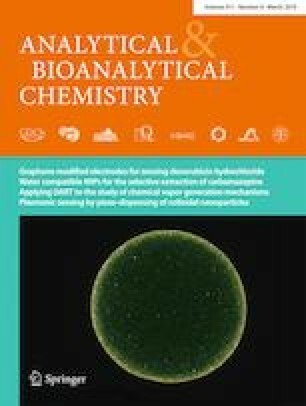 While the assay has been reported previously for aromatic amidine estimation in solution phase, here we describe its adaptation and application to amidine linked to diverse forms of solid matrices, particularly benzamidine Sepharose and benzamidine-linked cellulose membranes. These functionalized porous matrices find important application in purification of serine proteases. The efficacy of a protein separation device is determined by, among other factors, the ligand (amidine) density. Hence, a sensitive and reproducible method for amidine quantitation in solid phase is needed. The glyoxal reaction was carried out on microbead-sized Sepharose gel and cellulose membranes. Calibration curves were developed for each phase, which established linearity in the range of 0–0.45 μmol per mL amidine for free amidine in solution, 0–0.45 μmol amidine per mL Sepharose gel, and 0–0.48 μmol per mL cellulose membrane. The assay showed high accuracy (~ 3.4% error), precision (RSD < 2%), and reproducibility. Finally, we show how this fluorescent labeling (glyoxal) method can provide a tool for imaging membranes and ligand distribution through confocal laser scanning microscopy. The online version of this article ( https://doi.org/10.1007/s00216-019-01588-6) contains supplementary material, which is available to authorized users. This project was supported by the National Science Foundation grant DMR-PREM-1523463. Support was also received from instrumentation facilities created through Institutional Development Award (IDeA) from the National Institute of General Medical Sciences of the National Institutes of Health under grant number P20 GM103475. Additional research infrastructure support and services were provided by the Tropical and Emerging Infectious Diseases Research Program, from the grant U54MD007600 from the National Institute on Minority Health and Health Disparities (NIMHD). Ms. Adriana N Santiago Ruiz received research fellowship from NIH-RISE Program at the University of Puerto Rico in Cayey (grant number 5R25GM059429-20) to participate in this research. The contents of this manuscript are solely the responsibility of the authors and do not necessarily represent the official view of the NSF or NIH.